Jamie Vardy has decided that he will not join Arsenal in the summer and has instead signed a 4-year contract with Leicester City. 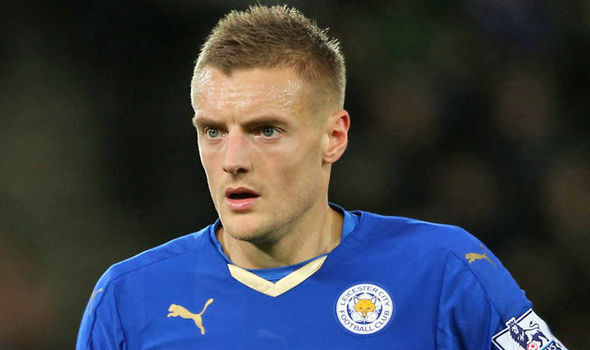 Arsenal made a £22m bid last week for the player, but Vardy has decided to stay with Leicester. This will be a major blow to Arsenal, who was looking for a new striker in order to boost their attack. Vardy was instrumental last season in helping Leicester City win the title, and Arsene Wenger was hoping that he could replicate the same form for Arsenal. The French manager has been under pressure since last season in order to mount a serious title push and this season he has started his transfer business early. He would have hope that having a quality striker like Jamie Vardy in the team will help him calm down the fans and boost the team attacking options. Arsene Wenger may now have to consider options for his attacking department. It is believed that he might make a move for RomeluLukaku. The latter has improved a lot during his time at Everton and may be a good alternative for Jamie Vardy. With Danny Welbeck out for 8 months and Giroud and Walcott struggling to find their scoring touch in the Premier League, RomeluLukaku can be quite a useful player. There are also media reports that Arsenal might be interested in signing Leicester City’s. RiyadMahrez. Indeed with the kind of season that the Algerian has had last term, it is easy to see why the big clubs are interested in signing him. However, now that Vardy has opted to stay at Leicester there is little chance Mahrez will want to leave the club. Leicester City will be keen to keep all their players together as they enter the Champions League for the first time.